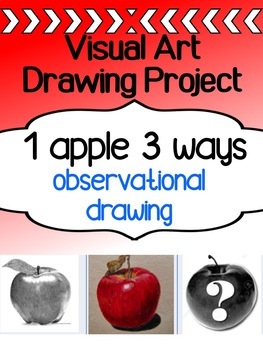 This is a perfect observational drawing project for high school students. 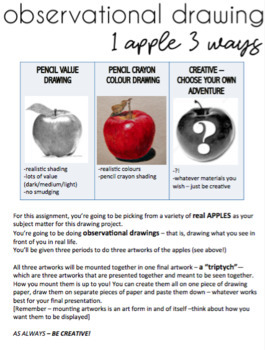 It asks them to use the most simple of all subjects - the APPLE - and do 3 different style drawings. I love to do this project during fall, and actually go pick apples for them! (it's cheap/exciting) and then they pick their own apple to draw from in class. You could always just have them bring in an apple from home / buy them at the grocery store / even use a photo off their phones...but it works great if they have an actual apple. I think it's important for students to have lots of choices with projects - and this project is no exception. Plus it opens up some great discussions around materials/learning the rules/learning to break them etc. I have them mount the final 3 artworks together in one long horizontal or vertical artwork. They look wicked. 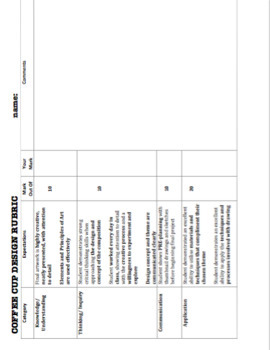 Also included is a simple rubric in case you want to include the mark as an assessment.